When you supply artwork for printing, there are 6 key features that will ensure your print order progresses quickly and efficiently. Please note the following requirements for print ready artworks. If you have any queries, please contact us and we will be happy to advise you. Bleed is one of the most essential requirements in print, yet one of the least understood. Bleeds are required to ensure that the edges of each page within a print job are separated by several millimetres rather than touching each other. This ensures the printed design runs neatly to the cut edge when the work is cut down to its finished size. For this reason, all print ready files require and additional 3mm of artwork on all edges of the area to be printed. This must be an extension of the artwork and NOT a white border. The diagram to the right shows how to position text and bleeds so that artwork content is optimally positioned for print. Tip: Make sure text and design elements are set 6mm away from the edge with the background design running all the way to the edge. This will ensure contents are not trimmed when the 3mm bleed is cut off. Failure to supply artwork files with bleeds can delay print jobs and may attract additional design charges to correct the files before printing. 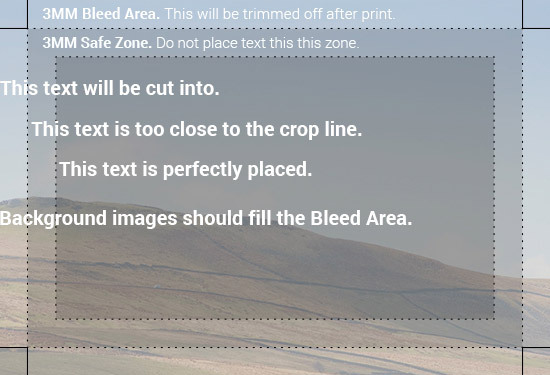 We always print to achieve finished dimensions after bleeds are trimmed, but require print files to be sized to larger dimensions that include the bleed area. Here are some examples of standard product sizes with and without bleed. If you are supplying print ready artwork files please note the with bleed dimensions. Resolution is the term used to refer to the quality of the printed output and is normally expressed as DPI (Dots Per Inch). DPI refers to the number of dots of colour per inch used to create an printed image and print files should be a minimum of 300 DPI to achieve a good result when printed. The less dots used, the more visible they become in the finished work. Generally, images from the internet are presented at 72DPI and will not print well at this low resolution. When an image is created in low resolution, it is generally not possible to improve it afterwards and these types of files should be avoided for printed materials. 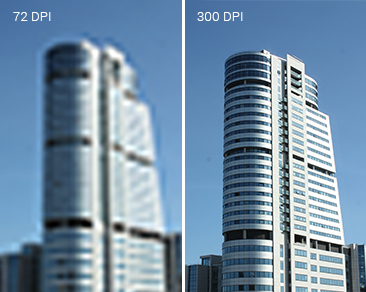 Here are 2 examples to illustrate high and low resolution print outcomes. 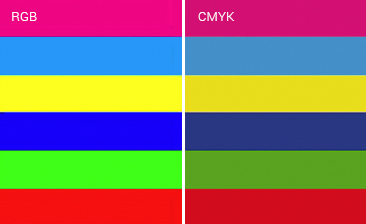 CMYK stands for Cyan, Megenta, Yellow & Key (Black). These are 4 inks that printers use to achieve the full spectrum of colours in printed designs. Full colour print works should always be specified as CMYK in print files. A common mistake is to design and supply artwork in RGB colour. This is primarily used to create coloured digital designs for display on the internet and is noticeably different than CMYK. The diagram illustrates the colour difference between the 2 colour reference systems. We can work with most file types, but prefer files for print to be supplied as editable JPG or PDF. Here is an overview of common design programs and the file formats we can accept from them. We can also accept open PSD, TIFF & EPS, but these can have quite a large file size and fonts may not be embedded (requiring extra work before printing). We can also accept open Illustrator files (AI, EPS), but require all images to be embeded and all fonts to be converted to outlines. We can also accept open Indesign files (IND), but please ensure all fonts & linked images are packaged up and supplied. Please export print ready PDF. Please export print ready PDF. Whilst we can accept open Word files, there will be a charge for conversion and proofing. This is because there is a risk that the file will not look the same when opened on a different machine than the one it was created on. Word does not support CMYK colour, so you are also likely to see colour changes. Please request a proof if you are concerned about colours. Please export print ready PDF. Whilst we can accept accept open Publisher files, there will be a charge for conversion and proofing. Publisher also does not support CMYK colour, so you are likely to see colour changes. Please request a proof if you are concerned about colours. Please export print ready PDF. Whilst we can accept open Corel Draw files (CDR), there will be a charge for conversion and proofing. Please export print ready PDF. We don’t accept open Freehand files (FH). If you prefer to use a different design package than those listed, please contact us to discuss suitable file formats for printing. Print files can sometimes be very large and difficult to supply as email attachments. For this reason, we supply a secure upload link for every print job clients wish to supply. Clients who prefer to supply print files on CD or USB will have their files returned with the finished work.